their stay at Secrets Royal Beach Punta Cana. It was like two resorts in one. We were in Punta Cana, our favorite area of the Dominican Republic, looking for a lovely beach, warm water and good food. We found it at a resort that’s aimed at families on one side and adults on the other. The 700-room Now Larimer Punta Cana is for adults with children while we stayed at the adult-only, 465-room Secrets Royal Beach Punta Cana. Guests at Secrets have full privileges at the Now Larimar. Punta Cana, at the far eastern tip of the island of Hispaniola, includes a stretch of the widest, white sand beach we’ve ever seen. Tourism is the major industry here with several dozen resorts strung along the coast that attract mostly Americans and Canadians but with a high percentage of Britons, Germans and Russians. Our first impressions of Secrets Royal Beach were very positive. The resort is built in a series of three story buildings separated by well maintained, tropical gardens and meandering pools. The rooms are bright, spacious and well equipped with a Jacuzzi tub on every balcony. By the beach there are swim-up bars, a series of restaurants and an area devoted to water sports. Several top international chains have resorts along this stretch of pristine, fine white sand that never gets too hot to walk on (seaweed is sometimes a problem but a concerted cleaning effort keeps it under control). We met the resort’s General Manager, Ricardo Dominguez, who told us how Secrets differentiates itself from other five-star resorts. He said there were three main reasons: First, a policy of not requiring wrist bracelets (many guests at other resorts have told us they’re considered ‘tacky’). At specialty restaurants, no reservations are required for dinner. Just show up between 6:30 and 10:30 and there should be little waiting for a table (we found this to be true). And third, there’s unlimited use of pool and beach towels (other resorts issue chits for one or two towels a day). Secrets clearly knows some of the irritations at other resorts. Mediocre food is often an irritation at all-inclusive properties but we found Secrets to take its food choices and preparation very seriously. The resort features an international buffet, La Riviera, with creative presentation and a wide choice of American-style and Dominican dishes. One evening the buffet was all-Dominican and was very tasty, especially the Sancocho stew, the national dish of the country made with a tasty blend of pork, chicken and beef. Specialty restaurants on the property include a seafood house, a Sushi restaurant, a steakhouse and an Italian eatery. The last was a disappointment with soggy pasta and no olive oil/balsamic vinegar for the Italian bread (just butter). To his credit, the manager did take note and promised to improve. As expected, the seafood was very well prepared with grilled fresh grouper as a highlight. During the day there’s also a beach grill with a good selection of burgers, hot dogs and chicken. We had it once (a burger and some chicken) and it was surprisingly good. One of our best meals, however, was at Now Larimar next door (where, as mentioned, Secrets guests have full access) and its adults-only French restaurant. The décor was high end with lots of sheer, silvery drapes, the service very professional and the food – brought to the table with silver dome covers – was outstanding. We both ordered, and loved, the goat cheese salad, beef Bordelaise and the perfect crème brulée. Secrets also offers an extra-cost Wine Cellar dinner where the chef prepares a selection of his most creative dishes, and each is served with a perfect wine accompaniment. We enjoyed a seven-course feast including grilled vegetable tartar with avocado foam, a bright two-tone red beet and curried fruit cream soup and a layered lobster entrée with ginger and julienne vegetables. All outstanding! 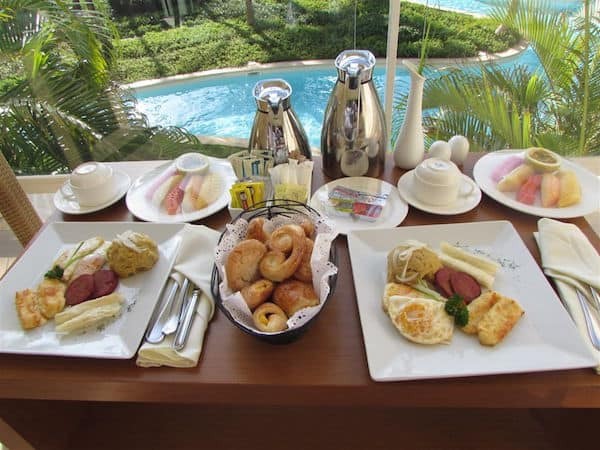 One morning we ordered a complimentary room service breakfast but chose all-Dominican treats – mangu (mashed plantain with onions), fried yucca, fried cheese and longaniza (Dominican sausage). These are also available in the Riviera buffet but tasted especially good on our balcony overlooking the Caribbean Sea and meandering pools. Both Secrets Royal Beach and Now Larimar have numerous bars spread throughout the resorts. There’s a daily cocktail special but the friendly bartenders can make anything a guest likes, especially with rum as a base (the local brand, Brugal, is excellent). The Dominican beer, Presidente, is also very tasty. The resort promotes ‘top-shelf’ liquors but, sadly, doesn’t have single malt whiskies (only Scotch blends), even in the Preferred Club, the extra-cost (and extra-amenities) section of the resort. The beach extends for miles in each direction with sand ideal for walking or jogging. Many guests chose to relax in their loungers spaced alongside the meandering pools but we prefer ocean swimming and discovered plenty of loungers, many under palapas with thatched roofs, by the wide beach. At extra cost, two storey Bali beds are available with butler service and special snacks. The waterfront was very busy with boats of all descriptions sailing or zooming by and plenty of opportunities for parasailing. Evening entertainment at Secrets was of a high standard with acts as varied as a Las Vegas-based acapella group and a local circus troupe (the latter forced to move indoors after a rare shower in the evening). Disclosure: The Nowlans were invited guests of Secrets Royal Beach but any opinions expressed are their own.